YouTube announced today that it is working to improve the news experience for its subscribers. To achieve this, Google will spend $25 million to develop new features that will improve the way YouTube disseminates current events. Part of that money will go toward helping news organizations build video operations. YouTube will also add more members to its team that supports news publishers. The video streamer points out that when there is breaking news, the story is written first before edited video becomes available. As a result, over the next few weeks YouTube users in the U.S. will see short previews in YouTube search results with links to the full news article. Stateside users will also see a reminder along with the search results on a developing story that states "details may continue to change." 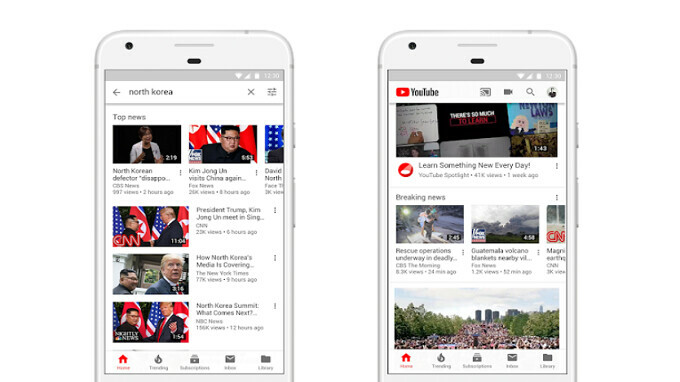 In addition, YouTube will promote videos from news sources in the search results under the Top News "shelf." The Breaking News "shelf" on the YouTube home page will show video from news sources about an event that has just occurred (check out the image at the top of this article). These two new features are now available in 17 countries including the U.S., U.K., France, Italy, Japan, India, Mexico, Brazil, South Africa, Nigeria, and more. Over the coming months, that number will double. Now, more than ever, the world is demanding access to news that they can trust. Apps like Google News are presenting all sides of a story, rather than picking a side and defending it. The best way to truly understand what is going on around you is to know both sides of the story. So youtube making aggressively it's way towards being propaganda machine now. Susan Wojcicki is pure f**king evil! As long as they just report what's actually going on, and not placing an agenda on their message, this is fine. So long as Hannity and Dobbs aren't included in their lineup... or any programming from Fox News for that matter, and I think INFO wars is on its final warning from YouTube so I doubt that they'll be included in the news feature anyway. Screw off Google. I will decide what news to read or watch, not the news that fits your agenda.